Last year, McCarter Theatre Center’s revamped its annual production of Charles Dickens’s A Christmas Carol for the first time in almost two decades. This season is the second with the update, and the new version is really coming into its own. Director Adam Immerwahr has achieved a solid Victorian England vibe for this sparkling production, which runs through December 31. The show manages to be both different with fresh sets and staging and familiar, retaining the adaptation by award-winning playwright David Thompson. Ebenezer Scrooge (played to perfection by Greg Wood) has never said “Bah! Humbug!” with more feeling, Bob Cratchit (Jon Norman Schneider) never more patiently put-upon, and the rest of the cast, mostly playing multiple parts, never more lively. Dickens’s work is stuffed with memorable characters, giving special mention of Mrs. Dilber (Sue Jin Song), Solicitor David/Mr. Fezziwig (Thom Sesma), Mrs. Cratchit (Jessica Bedford), and Mrs. Fezziwig/Lady Char/Laundress (Anne L. Nathan). Though many parts amount to a cameo, all were quite up to snuff. The familiar tale of a miser’s comeuppance is all there, how the Ghost of Christmas Past (Adeline Edwards) reminds him how he gave up his youthful opportunities for happiness in order to pursue wealth; the Ghost of Christmas Present (Mimi B. Francis) shows him how others, especially the Cratchits live now; and the Ghost of Christmas Future (Christopher Livingston, who also plays young Marley) lays out a frightening scenario that causes him to vow to change. Old Marley’s ghost (Michael Genet) has my favorite line from the story, the sententious “I wear the chains I forged in life.” The dark scenes change to light as Scrooge wakes Christmas morning a new man. The cast is augmented by a 36-member community and youth ensemble, whose members greet theater-goers, sing carols, ring bells, and dance exuberantly! The entire audience becomes involved, with the singing of a carol at the beginning and end of the performance. Production credits to Daniel Ostling (set design); Michael Friedman (composer); Charles Sundquist (musical direction); Darron L. West (sound design); Lorin Latarro (choreography); Linda Cho (costumes); Lap Chi Chu (lighting); Jeremy Chernick (special effects); and Gillian Lane-Plescia (dialect coach). In a Princeton talk last week, Sir Salman not only discussed the role of the novel in, as he said, “a world of lies,” but also how writers must work in the modern world. The fast pace of today’s world suggests that literary writers cannot be too topical without risking irrelevance in the near future. Shakespeare’s plays have survived four hundred years because they were about universal human truths, even if his characters bore the names of actual historical figures. Yet in The Handmaid’s Tale, Atwood put her characters in a story with a huge theme: radically changed power dynamics in an American society that has become a fundamentalist theocracy. Imagining such alternative realities should be the literary fiction-writer’s strength, Gawande believes. I’d love to hear the three of them discuss this issue together. I think they’d agree that, regardless of the novel’s scope, it’s the characters that make it resonate with readers. Another feature of modern life affecting authors is the loss of space between public and private action. He said that Jane Austen’s books, though replete with soldiers, never referred to the Napoleonic wars. Nor did Dickens ever mention the British Empire. The characters in these books lived unimpeded and unaffected by world events. Such is no longer true. “The history of the United States is now the history of everywhere else,” he said. We live in a world where we are barraged by outside forces, many of which can change our lives. It is not only our character that shapes our destinies, or those elements of chance and randomness that have always entered in, but the world around us (another point of agreement with Ghosh). Art tries to increase our awareness of what is possible for us to see and know. For that reason, artists must push the boundaries, despite inevitable opposition. Meanwhile, it’s the duty of everyone to work to protect our culture, the products of art. The power of art to outlast tyranny is great, but the power of artists, not so much, he said. They need to be defended too. Last Friday’s quick tips about writing cliff-hangers can help keep your reader immersed in your story. Today, here’s some of what we can learn from the masters. (Sources listed below). The Victorian novelists who published serials—like Charles Dickens—had to create chapter endings that would bring readers back the next week or month. The successful ones became experts at it. Thus, clinging fast to that slight spar (her infant child) within her arms, the (dying) mother drifted out upon the dark and unknown sea that rolls round all the world. Not: “She was dead.” By referencing the common fate of mankind, Dickens allies readers with the dying mother. Even in death, there is action; she is clinging and drifting. And there, with an aching void in his young heart, and all outside so cold, and bare, and strange, Paul sat as if he had taken life unfurnished, and the upholsterer were never coming. Not: “What in the world was he going to do now?” Dickens gives Paul’s common dilemma an engaging and memorable treatment through a specific visual image, a metaphor for loneliness. I put my light out, and crept into bed; and it was an uneasy bed now, and I never slept the old sound sleep in it any more. Not: “Pip tossed and turned all night.” Dickens lets you know something about Pip’s future here, but again, it is not all in his head, it’s tied to the physical reality of the light and the bed. It’s saying goodbye to childhood. These are moments of high drama and great resonance with the reader. They are integral to the tale, not tacked-on contrivances. Note how specific they are. They contain physical actions, not just thoughts and feelings. And paradoxically, by being so specific, they achieve universality. Modern writers don’t employ Dickens’s florid language, but they still can achieve an organic approach to cliff-hangers. By organic, I mean an ending that grows out of the story and gives it somewhere to go. There’s a vast difference between this last example and the weak one cited previously (“she had the distinct feeling that this peace was about to be brutally shattered”). In the negative example, the author is simply reports a conclusion—head-work—of the protagonist. If readers have been paying attention to the story, they’ve already reached this same conclusion. And, if not, well, there are bigger problems . . .
By contrast, McDermid’s characters are engaged in conversation (action, not reflection). Their statements propel the story forward; readers know what the characters next will do (explore the lead mine workings) or be (surprised). They react with an Aha! Or even Uh-oh. Don’t destroy your cliff-hanger’s value of by using it to tell readers what they already know. Let them run on out ahead of you. That’s what makes reading fun. The Dickens quotes, in order are from: Dombey and Son, end of Chapter 1, Dombey and Son, end of Chapter 11, A Tale of Two Cities, Book II, end Chapter 2, and Great Expectations, Chapter 18. The modern quotes, are from: Bill Beverly, Dodgers, end Chapter 18; Val McDermid, A Place of Execution, Part 1, end Chapter 13; Ibid., Book 2, Part 1, end Chapter 3. “Tomorrow the kind of work I like best begins: buying. Cherries and citron, ginger and vanilla and canned Hawaiian pineapple, rinds and raisins and walnuts and whiskey and oh, so much flour, butter, so many eggs, spices, flavorings: why, we’ll need a pony to pull the buggy home.” –Truman Capote, A Christmas Memory – Hear it here. See this photo gallery: China’s Harbin Ice Festival. “Our invariable custom,” replied Mr. Wardle. “Everybody sits down with us on Christmas eve, as you see them now—servants and all; and here we wait, until the clock strikes twelve, to usher Christmas in, and beguile the time with forfeits and old stories. Trundle, my boy, rake up the fire.” Up flew the bright sparks in myriads as the logs were stirred. The deep red blaze sent forth a rich glow, that penetrated into the furthest corner of the room, and cast its cheerful tint on every face. —Charles Dickens, “A Good-Humored Christmas” Chapter 28 from The Pickwick Papers. Antiquity Now!’s 12/17 post gives a recipe for Sfeni—yeast doughnuts dipped in honey—a traditional Sephardic Hanukkah dish. Looks pretty yummy! Check out the Antiquity Now! Website throughout the holiday season for more cross-cultural celebrations. Their brave and glorious lads so far away.” –John McCutcheon, “Christmas in the Trenches.” See it performed here. Don’t miss the ever-popular YouTube video: “Chinese Food on Christmas”! Now I’m off to make an eggnog pie. Back in 2016!! Happy New Year! Celebrate with these Dancing Fireworks! 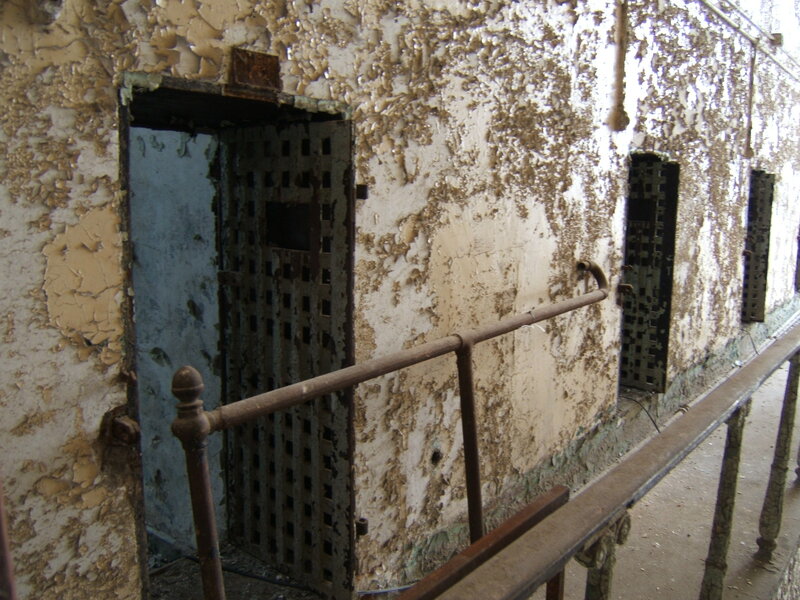 Many East Coasters recognize the photo featured on this website home page as taken inside the crenelated walls of Eastern State Penitentiary. A “model” institution when it was built outside Philadelphia in the early 1820’s, Eastern Pen remained in use until 1970, by which time officials deemed it “not fit for human habitation.” Governing magazine’s David Kidd recently created a photo essay about this crumbling institution, now near the city’s downtown. Kidd points out that the Quakers who built Eastern Pen originally constructed only single-person cells, so that miscreants would have absolute solitude to reflect on their crimes and on the Bible. This, the founders believed, would make men truly penitent (“penitentiary”). In this original sense, a penitentiary differed from a prison, where convicts mingled and shared cells. From the time a prisoner entered Eastern Pen and was led to his cell (wearing a hood) until the time he left (also hooded), he never saw or spoke to another human being. Later, with more crowding, that changed. The city fathers were proud of their innovation and eagerly showed it to visitors, one of whom was Charles Dickens. Dickens was horrified at the suffering he believed this total isolation would produce. He was inspired to replicate it in A Tale of Two Cities, where the solitary cell in the Bastille drove his character, Dr. Manette, insane. “I wished it would never end.” How many times have readers said that as they closed their book with a sigh. I’ve caught myself reading slower and slower over the last few pages of a book I’ve loved, just to delay the inevitable! But Dickens doesn’t give us that scene. He leaves us to imagine it. I can see amazement and joy mixing with horror and guilt when the realization finally comes to them, and they understand what Carton has done. What, in fact, he told Lucie he would do, some 200 pages earlier: “For you, and for any dear to you, I would do anything.” I see Lucie’s misery, as she recognizes the implications of Carton’s vow and feel the unbearable weight of her promise to keep it secret. My vision of that scene—and yours—is beyond the covers. Our own ending to solve and resolve. Sunday we saw the new movie Argo. A lot in that movie takes place by inference. As in the real world, the participants don’t have complete information and neither does the viewer, though we have the benefit of some multiple perspectives. Glimpses of the treatment of the main body of hostages let us imagine the rest. Likewise, details of the escape of the Canadian ambassador and his wife, also in deadly peril, must be mostly created by the viewer. Have you imagined final scenes involving the characters of stories you read, see, or listen to? Share!